It would seem, as things stand at the moment, that we might be heading for a good summer. After the long winter, which brought its own special pleasures, it will be very welcome. I hope that writing this is not going to be the kiss of death to July and August. But we were blessed with super weather while walking the southern half of Offa’s Dyke, an area well known for depositing rain. Having established camp at the Rising Sun in Pandy, we all met up at Sedbury Cliffs, Chepstow and the official start/finish of the 177 mile trail that runs along, either side of the modern England/Wales border. Marking the start with a photograph we headed off on woodland ridges overlooking the silty waters of the River Wye. Occasional breaks in the trees afforded us views across the valley at Wintour’s Leap and later overlooking the ruins of Tintern Abbey. We were walking through ancient woodland, which, with its very steep westerly slope, formed a natural barrier to the marauding Celts! Eventually we dropped down off the hills into the riverside village of Brockweir where the day’s walk ended in the Brockweir Inn. Returning to Brockweir the next morning, in glorious sunshine, we continued along the riverbank for three miles before climbing back up to the forested ridge. Views were restricted by the density of the forest, but it gave us welcome respite from the intense sunshine. We descended briefly to Lower Redbrook for lunch by the river, before climbing yet again, through pastureland to Kymin. At the top of the hill is a round house, built by the gentlemen of Monmouth as a place to meet and dine. The adjacent Naval Temple was built in 1800 to commemorate the naval victory in the Battle of the Nile in 1798, and other similar naval battles. Admiral Nelson visited it in 1802. 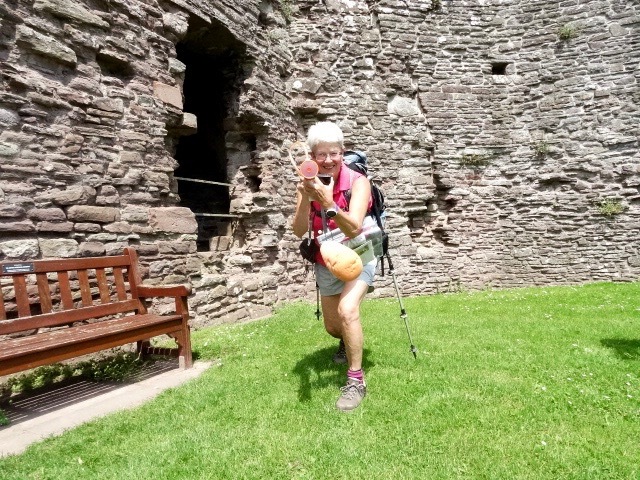 We descended into Monmouth where we took a little time out in Wetherspoons before continuing through more delightful woodland and countryside to Lower Hendre where we picked up the waiting minibus. 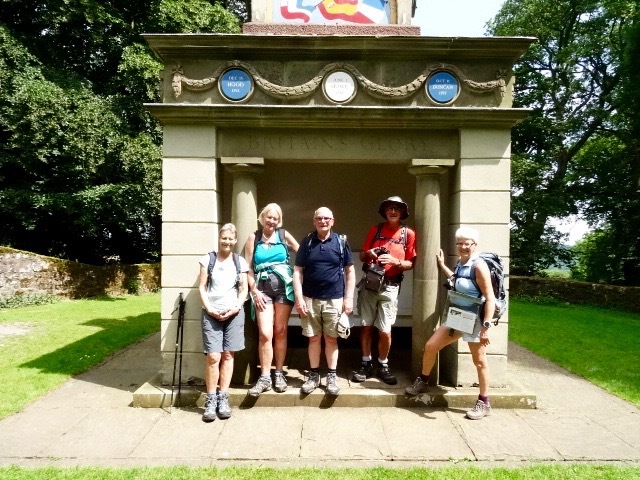 If the first two days had been dominated by woodland walks, the third day was very much about walking across pasture and arable land, of rolling countryside and just the odd hint of history. It was extremely pleasant walking. For lunch we sat on grass surrounded by an ancient moat, where once had stood a medieval Manor House. Unfortunately, for the next couple of miles the path was diverted along a lane because of overhead power line work, but as this gave us the short side of a triangle to walk, nobody really complained. This brought us to White Castle, which is one of the castles that featured on the Three Castles Way. When we visited it a few years ago there was an entry charge but that now seems to be a thing of the past. It is the largest of the three castles, the other two being Skenfrith and Grosmont. Inside we found a child’s toy gun which gave Claire some fun as she shot David and me with a large, orange sponge bullet! From White Castle we skirted around the eastern and northern slopes of the Skirrid, taking a welcome detour into the Hunters Moon Inn at Llangattock Lingoed, originally built to serve the stonemasons building the adjacent church. Soon afterwards, we walked into camp. 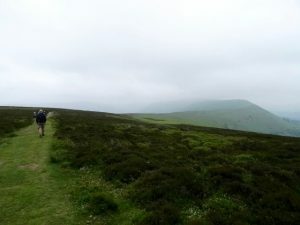 Our final day’s walk before we moved camp saw us climbing out of Pandy on the the long, open moorland path that took us the length of the Black Mountains towards Hay. Although this took us to the highest point along the whole of the Offa’s Dyke trail, it is not necessarily the most interesting, and the fact that for much of the day cloud hung about just above our heads meant that whenever there were possible far reaching views, they were limited. Quite a strong breeze kept the temperatures down, making it perfect walking weather. We made very good time and were back at the minibus at the foot of Hay Bluff, at 2.00pm. Plenty of time for us to call into the bar at Llanthony Priory for some refreshing tea! That night we ate in the Oldest pub in Wales, the Skirrid Mountain Inn, where Judge Jeffreys supposedly condemned some of those before him to hang from the hook in the ceiling of the bar. No hangings on this evening, just good food and beer. 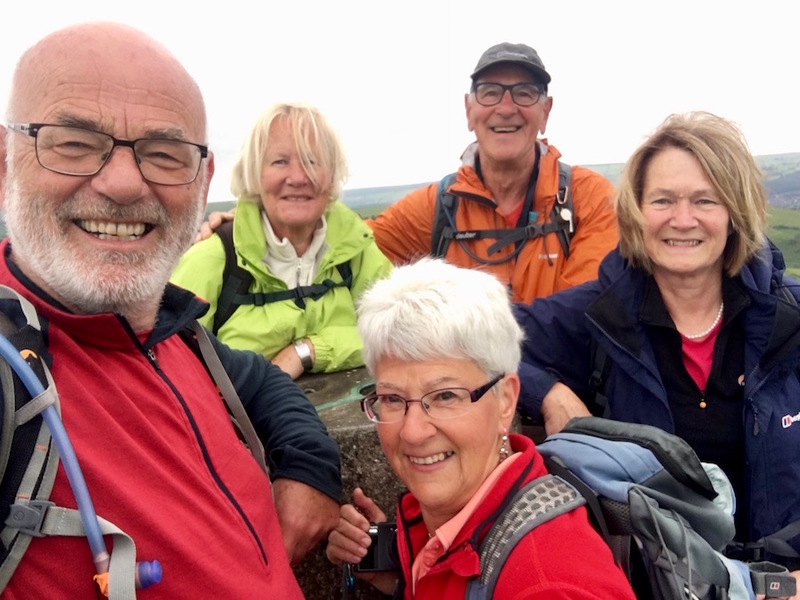 While the group walked with David to Newchurch, I transported all the kit to our next base at Rockbridge Caravan and Campsite just outside Presteigne. This was a perfect site. We had a flat pitch on the banks of the tranquil River Lugg. 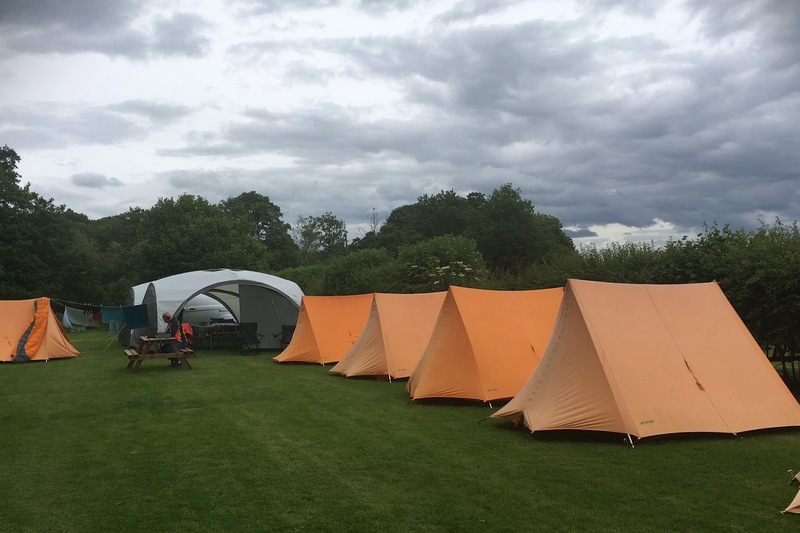 The camp facilities deserved a 10/10 score and the manager, Steve, was really welcoming, friendly and helpful. 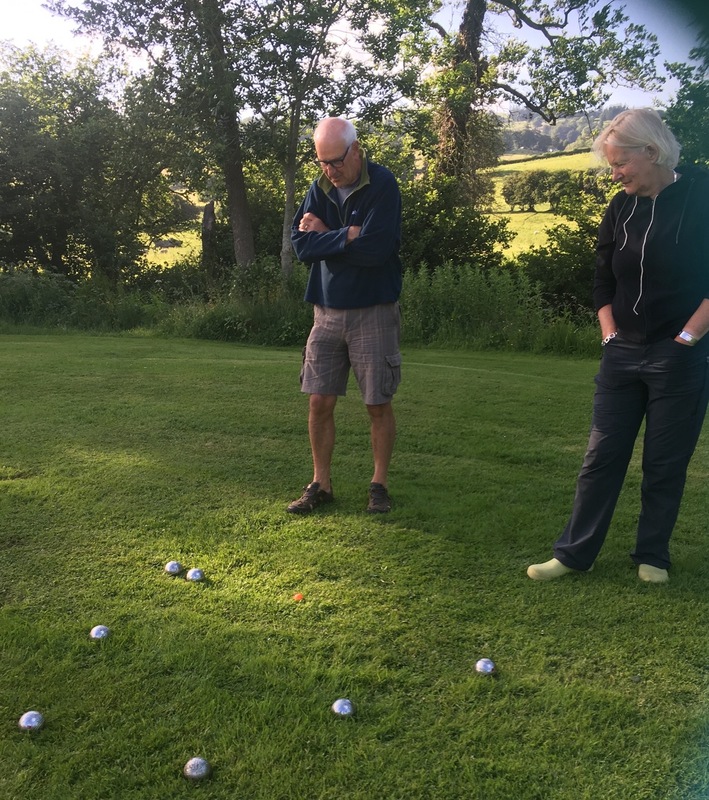 Having set everything up with help from Paul, Angela and Annie, I travelled to Newchurch to meet the group. They had, again, made good time and I found them sitting in the church yard drinking tea. Inside the church there is a help yourself cafe for passing travellers. What a great idea to make the church accessible to all. It is very satisfying to see people’s reactions when you introduce them to their home for the next few days. Rockbridge certainly ticked everybody’s boxes and it even surpassed the excellence of the two sites we used on the Jurassic Coast last year. If we had thought the walk was stunning so far, the next two days were going to surpass all our expectations. The first day was relatively short, taking us to Kington. Firstly, we climbed out of Newchurch up to the open moorland of Disgwylfa Hill, which gave us views over hills with a lot of walking potential and deserving of further investigation. I’ll save that for another day. 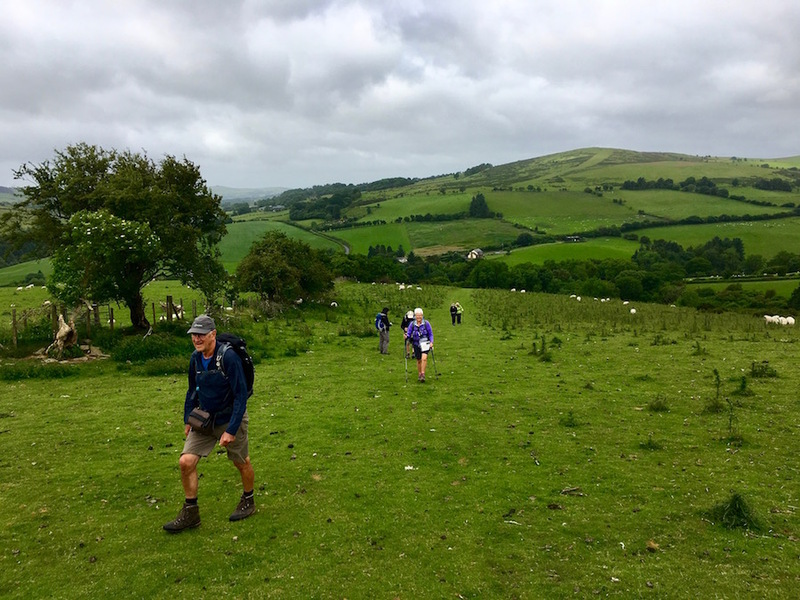 We soon found ourselves in Gladestry before the climb up on to the Hergest Ridge, a long ridge of open moorland and outstanding views. The dominant hills are those of the Radnor Forest which rise in excess of 2000 feet. From our lunch stop by nine monkey puzzle trees on the top, the guide book tells us that from this vantage point we could see fifteen counties. Unfortunately the guide book did not name them so most of our lunch break was spent agonising over them. We got nowhere near the fifteen and now that I am home I’m not going to waste my time trying to name them all. It is sufficient to say that the view in every direction is stunning and, in the perfect conditions we were experiencing, far reaching. Our descent into Kington followed and we treated ourselves with tea and cake in the Border Bean Cafe before heading back to camp for games of Kubb and Boule in the glorious evening sunshine. 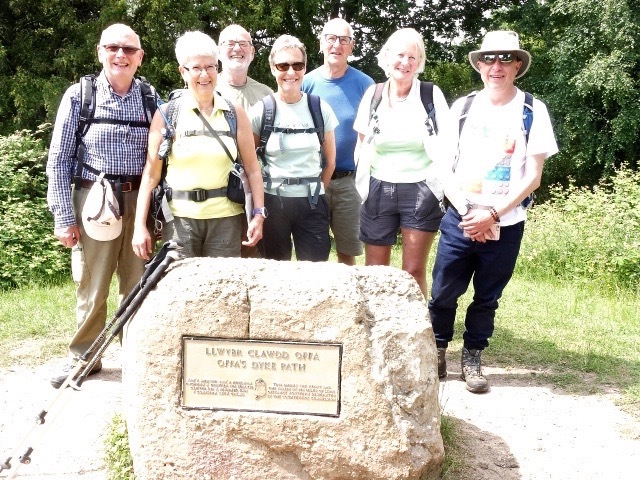 David and I convinced the group that we could walk from Kington to Knighton on our penultimate day as it was only about 12 miles. 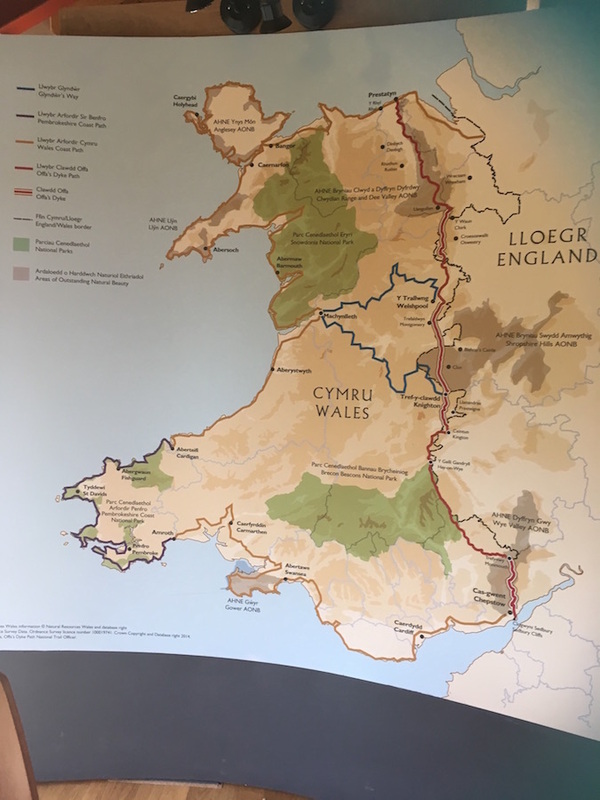 During the course of the walk I was consulting my Cicerone map when Kath peered over my shoulder to read that it was actually 14 miles. Oops! Any mistrust they might have had with us soon dissipated by the sheer beauty of the walk and the countryside we were experiencing. Singing rousing songs also helped make sure they remained cheerful. 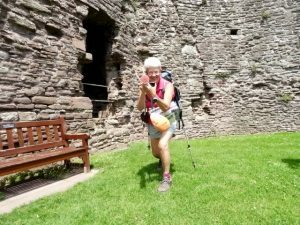 Despite it being two miles longer than they were expecting, we reached Knighton in good time, arriving at the Offa’s Dyke visitor centre at bang on 4.30, the time when they stop serving tea and cakes. However, the girl behind the counter was so obliging she made us tea and served us lovely portions of chocolate sponge cake. My plans to be abstemious on such occasions seems to have deserted me, but I deserved it. I had, after all, walked two miles more than anybody had expected! A slight deterioration in the weather greeted us for our last walking day. It must have been Tina’s fault, who joined us for the last day. A touch of overnight and early morning rain meant, that for the first time during the week, I needed to wear boots in order to keep my feet dry. Until the weather improved the long grass was going to hold droplets that would quickly soak through trainers. Also, gone were the clear views that we had so enjoyed so far. 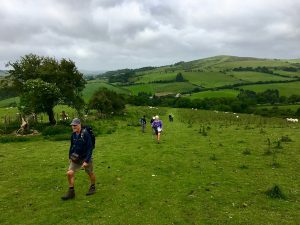 The first half of the walk up to the ridge above Knighton and along to Cwm-sanaham Hill was lovely, and, although we were walking along visible stretches of the dyke, much of the path beyond was tedious under foot. It was strewn with masses of sheep poo, which we tried our best to avoid. Nevertheless, we made good progress and reached the minibus, parked in the village hall car park in Newcastle-on-Clun, in time for a late lunch. We preferred to sit on the dry seats of the bus in preference to the wet grass. 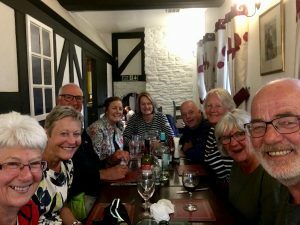 That evening we ate in the Royal Oak in Presteigne to celebrate the end of an excellent week’s walking. It didn’t quite have the atmosphere, or the sense of history of the Skirrid Inn, but the food was good. We had walked 89 miles in perfect conditions. I wonder, when we walk the northern half, in early September, whether we will be able to say the same. The weather is usually good the week schools go back. Let’s hope that is the case this year.